Anyway it looks like OpenWRT supported it once upon a time – it’s still listed in the source tree, albeit broken. The omap24xx doesn’t seem to be in any of the branches or tags, so I don’t know how things get there. Revision 30798 seems to be before they added the “broken” tag, so maybe that’s a good place to start. 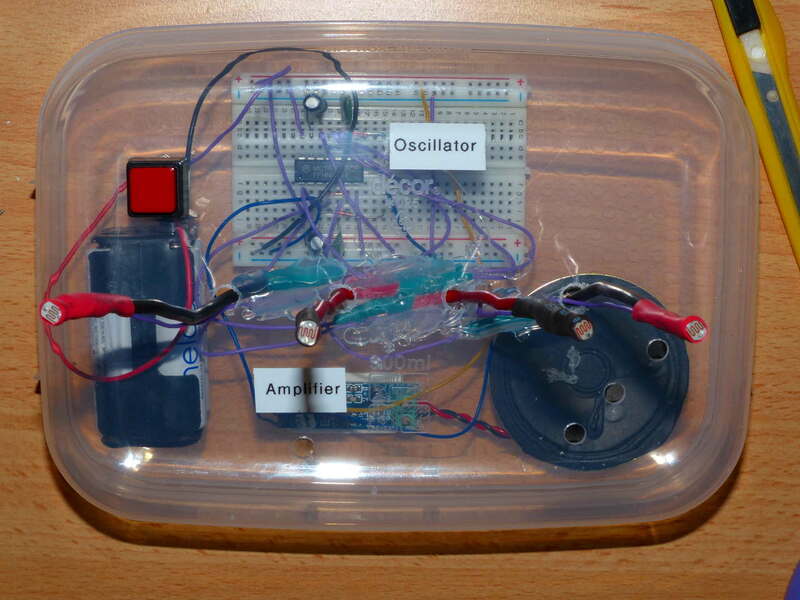 For Science Alive, I made a simple circuit that made noises in response to light changes. Being something which makes noise it was popular with the kids. It’s based on circuits described in Nicolas Collins’ “Handmade Electronic Music“. A few people asked me a circuit so I’ll describe it here. 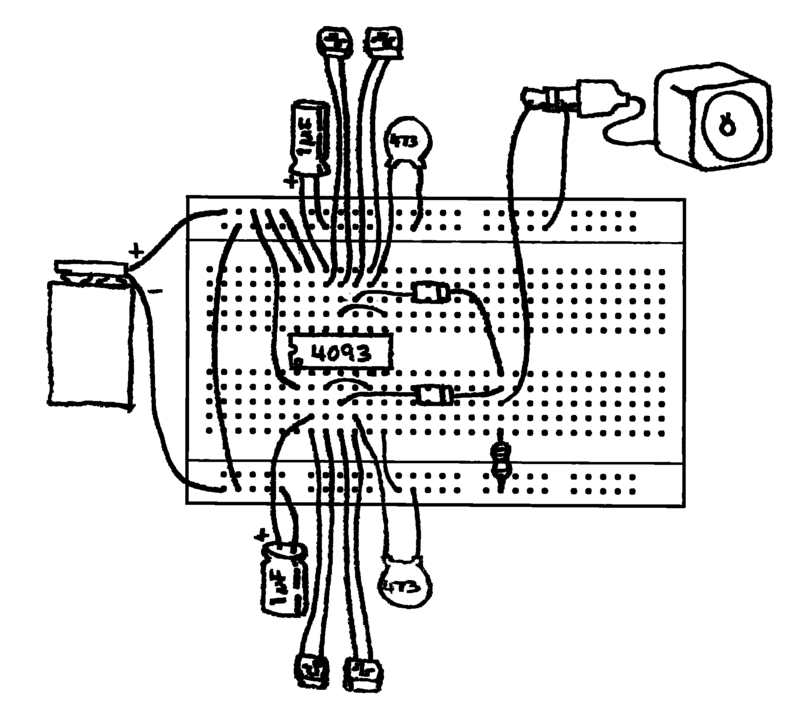 The circuit contains four oscillators provided by a 4093 Schmitt Trigger quad 2-input NAND gate. Individual inverting Schmitt trigger gates can oscillate, and by having more than one I could get one to turn another on and off, and mix the output of different oscillators together. You’ll need to play with different valued capacitors, I’ve listed the values I’ve used but try some different ones, particularly since your LDRs might be different to mine. Here’s the schematic. I chose to pair my oscillators so that one turns the other on and off, and connected their outputs with diodes. 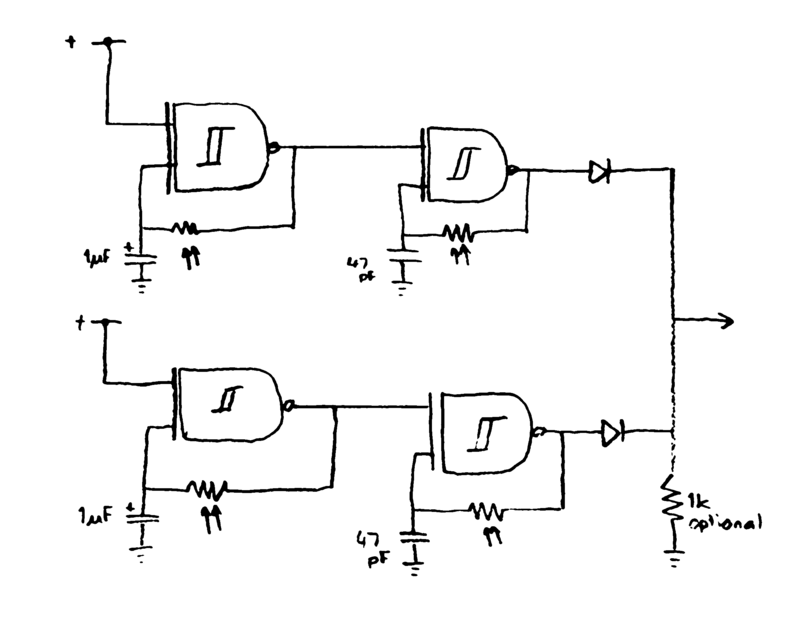 You can connect all four together in a line, or connect all of the outputs using diodes. I’ve shown a resistor to pull the output down when the oscillators are all low, but the amplifier probably has enough resistance at its input for that. You can also see this video of it in action. Create a new Virtualbox VM, give it 32MB of RAM, and get it to boot of the x86 image. Give it two network adapters: one on an “internal network” – this will represent the wireless network – and one set to NAT, this will be the ethernet port that we can log in with. You can forward a port through the second adapter for telnet access, that way you can cut and paste stuff. Start it up. This doesn’t work with the (rather dated) version of Hiawatha in OpenWRT. This describes how to handle the “php” extension, but it doesn’t tell it to actually use it. Note the “FastCGIid” line, this needs to go later in the file where the “default” site is configured – that is, where WebsiteRoot is. I want to get clients to connect to some website – presumably their home page – to be redirected to the guestbook. One way to do this is to change each name lookup to redirect to the router instead. I’ve been asked to look at using a venerable TP-Link TL-WR703N as a virtual guestbook, where people can connect using Wi-fi and leave a message. I plan to use OpenWRT on it, since they support that device. It will have a USB stick attached to it, so there will be plenty of storage space (kind of, see below) and the CPU is adequate, but the system needs to fit in 32MB of RAM, so there’s a few things to consider. Apache HTTPD ✗ Big. Not really designed for this kind of thing. ✗ I’d have to write stuff myself, with the associated performance, conformance and security gotchas. I need virtual hosts so when people open their web browser and go to some random site (whatever their home page is), they get redirected to the guestbook. Ideally this won’t be a 301 permanent redirect, so when people go to their Kittenwar home page they don’t end up being sent to the (now non-existent) guestbook. I can only run a few processes at a time before the RAM fills up. This could be handled by the web server, or if fastCGI is used, the runtime for the script. I first thought I’d only server one at a time, but if one client isn’t responding that will block all other users. 4 processes should be enough. Setuid would be handy so the server can run at port 80 as an unprivileged process, but I could use iptables to redirect the port instead. Hiawatha looks like the most suitable, but nginx would be OK too. Neither can control how many CGI processes are run, but PHP has a FastCGI option that does this. Something needs to handle the form submission. For a small environment C would be the ideal choice, but it’s hard to avoid security problems and I’d rather avoid having to use the OpenWRT build environment. The options I see are PHP, Perl and Lua. PHP is good for this kind of thing and I’ve actually used it before, so it will do. PHP also has control over POST sizes (I don’t want people filling up the storage) and how many processes it starts. While running, PHP seems to use about 1MB of private space per instance, so a few processes can run. I’ll need to try it in FastCGI mode too. The device only has 4MB of storage, so jamming the web server and PHP into that could take some doing. I do have perfectly good and relatively unlimited storage on the USB stick. I’d like to overlay a filesystem on the USB stick over the stock OpenWRT image to give me plenty of space. I’ll also know exactly what I’ve changed by looking at the overlay filesystem. One problem with this system is it can have its power cut at any time. I’ll have to live with that risk. ext4’s journal should help avoid fscks, and there won’t be that many writes so the journal shouldn’t make much difference to the flash life (I’d expect hundreds of writes a day, not millions). I can think of three options for this: one flat file, one file per post and sqlite. I’ll rule out sqlite because I don’t know what its memory consumption is like, and PHP doesn’t seem to give you access to any memory tuning options. One flat file would be the most space efficient, but corruption could be a problem if the device loses power or I stuff up the post script and there’s concurrent access. I don’t get random access either, should I want to “show the last few messages” or something. One small file for each post allows random access and reduces the chance of corruption. It wastes a lot of space, but I have a whole USB stick to use, and using smaller clusters on the filesystem should limit that. When you use some wireless hotspots, they first redirect you to a page with their legalese on it. This is called a Captive Portal. I can use the same thing here to redirect the user to the guestbook when they open their browser. The idea in this case is to tell the client computers to use the router as the default gateway. iptables then redirects all connections to a web server, which does a temporary redirect to the real web server. If the clients have cached DNS entries, this method should affect that the least. This is why virtual hosts are useful in a web server – any host but the correct one will get the redirect page.